"Oberlin Then and Now" began when the Oberlin Heritage Center Collections Assistant received a large donation of old Oberlin photographs. The focus of the project is to show Oberlin’s changing architectural landscape, while also drawing a comparison of buildings from the past and the present. With the help of Ohio Humanities Council intern, Rachel Luczkowski, the Oberlin Heritage Center was able to explore this project in greater depth as well as create a virtual exhibit on their website. The exhibit draws from many different materials and sources including Oberlin College Hi-O-Hi Yearbooks, college catalogues, old city directories, sketches, photos, postcards, and paintings. 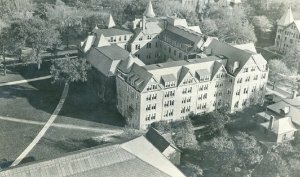 The focus for this particular exhibit has been college dormitories, boarding houses, and other Oberlin facilities, but in the near future, the Oberlin Heritage Center hopes the project will encompass all of Oberlin’s unique architectural histories in the exhibit. The Oberlin Heritage Center gratefully acknowledges the Ohio Humanities Council for its generous financial support of this project and the Oberlin College Archives for their research assistance and contributions.